Adding a new countertop to your kitchen is one of the best ways to elevate the look and feel of your kitchen without undergoing an entire kitchen renovation. At Custom Craft Cabinets & Millwork in Burnaby, BC, we have the high quality materials and exceptional craftsmanship you need to get the countertops of your dreams, built to last for years to come. Our team will help you with every step of the process, from selecting the right material for your kitchen to crafting the countertop pieces to the final installation. As you work to decide which kitchen countertop material is right for your home, there are many factors to consider. How much are you willing to spend on a countertop? What level of maintenance do you want? What overall aesthetic are you going for? And how hard are you on your countertops? Quartz: Also known as engineered stone, quartz is an extremely popular kitchen countertop choice that has a similar appearance to granite with better stain resistance and less maintenance. Quartz countertops are made up of about 90% to 95% ground quartz, with the remainder comprised of resin that holds the particles together. This makes the countertops very resistant to stains and scratches. It also comes in a wide range of colors, so you can select the right look for your space. Stone: Natural stone countertops made from soapstone, limestone, or marble, are extremely popular options due to their natural beauty and heat resistance. Soapstone is typically dark grey or dark green in color, with a smooth, soft feel. Limestone is lighter in color and requires sealing to prevent stains. Marble provides a luxurious, veined look, but comes with a higher price tag. 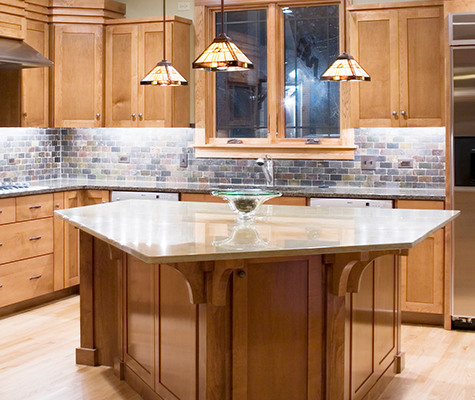 Laminate: Laminate countertops have long been a staple as affordable, quality countertops. Made of plastic-coated synthetics, they come in a wide range of colors and are easy to clean and maintain, and resist stains better than some natural stones. Granite: For a high-end option, many homeowners turn to granite. It’s an extremely beautiful contribution to any kitchen and holds up well to use, including resistance to heat and scratching. 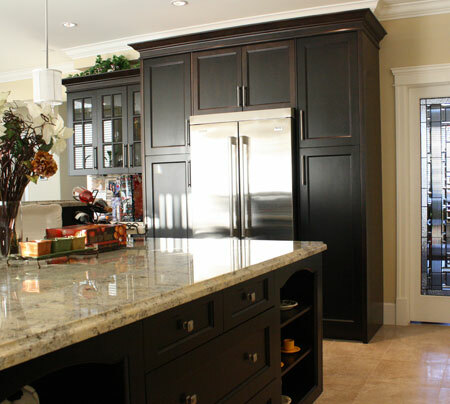 When you work with our team at Custom Craft Cabinets & Millwork in Burnaby, BC, you’ll get high quality customer service and craftsmanship throughout the entire process. Whether you already have a specific vision for your new countertops or you’re just starting to consider different countertop types, our designers will work with you to hone your idea and turn it into reality. We provide reliable, beautiful installation, leaving you with a kitchen that looks and feels brand new. Call us at (604) 435 2422 today to find your new countertops!